PEARL HARBOR - Commander, Third Fleet (C3F) hosted the inaugural Rim of the Pacific (RIMPAC) Innovation Fair, June 29 and 30. Twenty-two countries and nearly 2,000 attendees, including exhibitors, staff and patrons, participated in the fair, sharing cutting-edge concepts and the latest technologies. 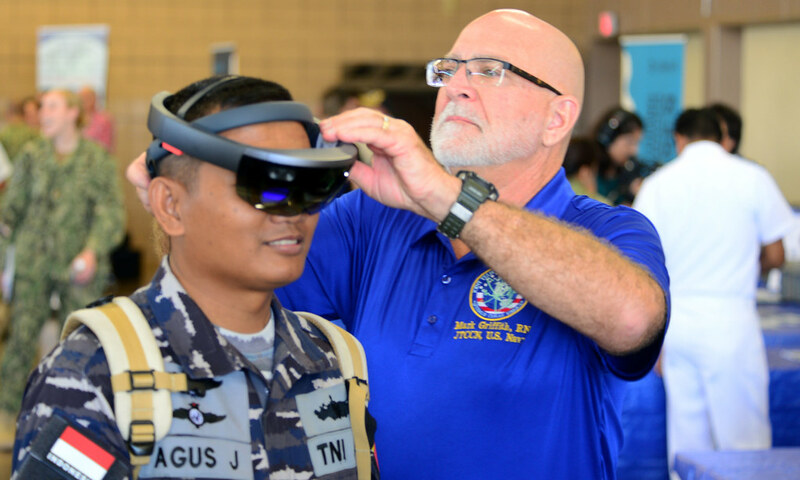 "This Innovation Fair provided an ideal platform for our international participants to experience face-to-face interactions with partners-at-sea," said Cmdr. Brett Elko, assigned to C3F. "We wanted to encourage more engagement at the deckplate level, connecting developers to our most junior Sailors and those who will be using and applying these innovative technologies and concepts." The fair featured 22 exhibition booths focusing on sonar, power and fuel, underwater unmanned vehicles, medical, space and augmented and virtual reality innovations. "Innovation is key to staying at the forefront in sea power," said Capt. Chris Sund, assigned to C3F. The All Partners Access Network was unveiled at the fair. The network provides a secure platform for real-time communications and data exchange, and is accessible to all nations, to include their militaries and supporting non-government organizations. "This RIMPAC Innovation Fair, which is part of the largest naval exercise in the world, provides the perfect opportunity for like minds to gather on an international scale and share their latest concepts for improving our capabilities and quality of life for our sailors," Sund said. Certain technologies were highlighted at the fair, including survey mapping, fuel cell technology and medical prosthesis. "The RIMPAC event has given us an opportunity to showcase technology we've developed to improve warfighter readiness to an audience outside of our borders and get feedback from those individuals," said Andrew Pedtke, an orthopedic surgeon attending the fair as an exhibitor. C3F plans to continue the Innovation Fair as part of RIMPAC to increase outreach, collaboration and fleet feedback from all capable adaptive partners involved in the international exercise. "I want to thank you all for what you've done to make this happen," said Vice Adm. John D. Alexander, C3F. "We're hoping that in 2020, we'll double the amount of participants at the Innovation Fair." Twenty-five nations, 46 ships, five submarines, about 200 aircraft, and 25,000 personnel are participating in RIMPAC from June 27 to Aug. 2 in and around the Hawaiian Islands and Southern California. The world's largest international maritime exercise, RIMPAC provides a unique training opportunity while fostering and sustaining cooperative relationships among participants critical to ensuring the safety of sea lanes and security of the world's oceans. RIMPAC 2018 is the 26th exercise in the series that began in 1971.